Why should I order the newsletter "Holistic Vision": Read and decide! This is the latest issue of “Holistic Vision”, the spiritual project by the author and consciousness researcher Floco Tausin. It is devoted to a phenomenon known as idiopathic or harmless “eye floaters” or “muscae volitantes” (see pictures) among ophthalmologists. We see them as scattered, mobile, transparent dots and strings in our visual field. “Holistic Vision” includes ophthalmology but questions its conclusion on floaters and goes beyond. For the observation and open eye meditation reveals a connection between altered states of consciousness and the way floaters look. Furthermore, a look at different cultures highlights floaters as an object of art and spirituality. By this “holistic vision”, Floco Tausin pursues the question whether these spheres and strings are first appearances of a shining structure of consciousness within which we cover a distance to our spiritual origin – a path that lights up through open eye meditation. Lights from the Other World. The Lead Story can be accessed by members only. No floaters, but a whole bunch of different subjective visual phenomena, as seen by reader Karen. Floco comments from a physiological and spiritual perspective. 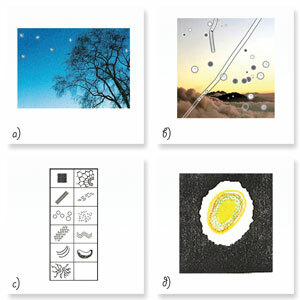 Some entoptic phenomena: a) flying corpuscles; b) eye floaters; c) form constants; d) afterimage (source). F: Not sure if I know that one. “Plastic film” sounds like there might actually be something on the lens … ? F: Your description fits the “blue field entoptic phenomenon”, as physiology calls that numerous dancing bright dots moving in curved tracks. From a seer’s point of view, it’s energy (prana, chi) moving in the shining consciousness structure. F: We could call that one ‘mechanically (by pressure) induced phosphenes’. Physiology tells us that it is generated by retinal neurons’ randomly firing. It may have a holistic significance if we understand the induction of phosphenes (mechanical, electrical, magnetic stimulation) as a way to temporarily intensify our consciousness state or energy flow respectively. Phosphenes, then, are the visual expression of energetic fields, generated by this intensified flow of energy. F: I guess you see that with your eyes closed? I'd say it’s again phosphenes, but this time induced by extending inner light, love, silence. Neurologically speaking, through meditation you increase neuronal activity which becomes evident in phosphenes lighting up. Spiritually speaking, you increase your inner light which becomes evident in your field of vision. F: Possibly a mixture of so-called after-images – representing visual memories of objects, fading out after a while – and phosphenes. From a seer’s point of view, after-images are not entirely generated by inner light (as they need outer light stimuli), but they may nevertheless be a vehicle to explore the ‘inner screen’, as they are between waking and dream state. F: Outer and inner light may dye our visual field in different colors. I’m aware of the interesting link of these colors to chakras, but did not go into detail until now. Fact is that there are different systems of subtle energy centers in the human body. If you see different colors that you manage to attribute to different consciousness states, I suggest that you create your own ‘chakra’-system. F: Like point four, it’s probably phosphenes. They seem to be in between the crystal clear floater lights and visual dreams. Dreams seem to be born out of inner visual light; light is transformed into thoughts and images by our consciousness in a certain state; in other states, we may be able to perceive the light directly, as colored phosphenes, or as bright floater dots. F: A phenomena of phosphene-like after-images. Or, more spiritually, it‘s the trees’ auras. During my time of learning with my mentor seer Nestor, I focused a lot on after-images to practice visual attention towards inner light phenomena. 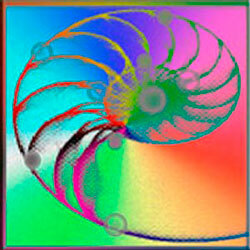 To me – and without the intention to reduce auras to physiology – aura seeing includes processes of after-images. F: Physiologically, it might be some phosphene / after-image / aura phenomenon. To people interested in aura seeing, it will definitely have some spiritual meaning which I'm not familiar with. F: Same as no. 9. F: A well-known creepy effect. Physiologically, I think it’s after-images that blur your face. To me, it’s a nice experience that shows that it’s not a solid world we live in. Thanks again for sharing your phenomena! Eye floaters and their meaning were interpreted differently depending on the time, culture and personality of the observer. We learn a spiritually meaningful perspective about floaters from Nestor, the seer, with whom I have studied and whose teachings I recorded in the book „Mouches volantes – Eye Floaters as Shining Structure of Consciousness“. In this category, a particular statement from the book on floaters shall be presented and explained. Nestor explains the idea that the distance of objects in the ‘picture’ (the visual field) is a question of consciousness. Individual consciousness is understood as something that becomes active on different “layers of consciousness” in the shining structure. As the glance of a reader wanders through the pages of a book and catches a part of the complete work on every page, so consciousness wanders through the layers of the shining structure and catches different aspects of the picture. The concrete nature of these layers remain vague. They cannot directly be seen. Their existence becomes obvious, for example, by experiencing the phenomena of ‘light jumps’. This is the observation that shining structure floaters and the objects of the material world seem to abruptly move nearer in intense consciousness states. Floaters and objects look bigger in size and more intense in light and color. The process is interpreted by the seers as inner light activating – or jumping to – a closer layer of consciousness. At the same time, the seers understand this as an inner or spiritual forward movement on the path in this shining structure. What prevents us from realization of the multi-layeredness of consciousness and the walking on that path is our stability on a particular layer. The reason for that is a lack of energy. Much of our energy is bound in psychic qualities and material objects as a result of upbringing, education and lifestyle. According to the seers, we become able to free ourselves from being tied to one particular layer by raising our “inner pressure” or inner intensity respectively, and let it freely flow into the picture as a whole. 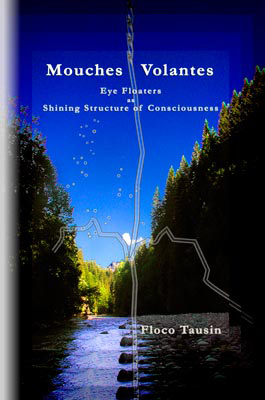 - Tausin, Floco: Mouches Volantes – Eye Floaters. The Shining Structure of Consciousness, Bern 2009, (ISBN: 978-3033003378). The category "Quarterly Picture" introduces realistic, artistic and/or spiritual/religious representations from different cultures and times which could show entoptic phenomena, or be inspired by it. Tim Stevenson is a floater sufferer from the US who took the time to observe and draw what he actually sees. He sent me that picture to raise public awareness of suffering from floaters. There are a lot of people reading and posting in floater talk web-forums who see the same kind of floaters drawn by Tim (see picture). These floaters are also the ones I’m writing about, the “shining structure floaters”, as I call them to better distinguish them from other floater types. Shining structure floaters by Tim Stevenson. Tim had his eyes examined by an optometrist and a retinal specialist. Both stated that there was nothing wrong with his eyes and that they could see the “harmless debris” in the vitreous. Tim is reluctant to believe that the examiners actually could see the floaters – and I second that feeling. In my opinion, the examiners may have seen some debris, but hardly the hundreds of spheres and strands Tim actually sees and draws in great detail. 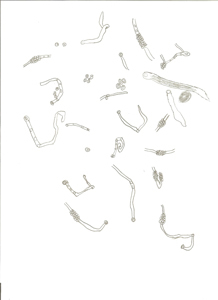 Tim’s explanation of his floaters stems from the floater talk forums where this type of floaters is called “clear worms” or “crystal worms”. It is explained as “very close to the retina or in the premacular bursa region”. The premacular bursa, a space located between the vitreous and the retina, is brought forward by a few laser surgeons who are specialized in laser treatment on eye floaters. They use it to speculate about the whereabouts of those crystal floaters they actually can’t see and treat. The premacular bursa explanation is not recognized by the majority of ophthalmologists. While these floaters talk forum members and laser surgeons do not recognize and acknowledge the cultural, artistical and spiritual dimensions of the shining structure floaters, some of them, like Tim, do a good and important job to carefully observe and distinguish the different types of floaters – some of which are indeed vitreous opacities and may be treated by laser surgery or vitrectomy. In Tim’s case, his “ring shape floater” may actually be some debris in the vitreous, as he describes it as “very dense”, as “shadow floating in almost all lighting conditions” and as “causing me all the problems. I can't ignore it due to the darkness, size, and movement of the floater.” In any case, close observation is the first step to recognize the deeper meaning of floaters. And that may be, at least, a coping strategy for those suffering from shining structure floaters. Thanks Tim, for that picture. May your eyes be well, may your floaters light up. You will find this and other pictures in the gallery. Do you have drawings of eye floaters or other entoptic phenomena (flying corpuscles, afterimages etc.)? Do you know of realistic, artistic and religious representations of such appearances? Then send me the picture or give me the tip; I would like to publish it in the newsletter and/or in the gallery. You’ll find a complete list with all previous publications in German and English (monographs, anthologies, magazines) at Website. These articles are also available in the member area. In Western culture, the phenomenon of vitreous floaters (or muscae volitantes) is primarily understood in line with modern ophthalmology as "vitreous opacities". The review of visual arts from former and non-Western cultures representing mythical and spiritual ideas, however, discloses abstract symbols that resemble the typical structures of eye floaters. 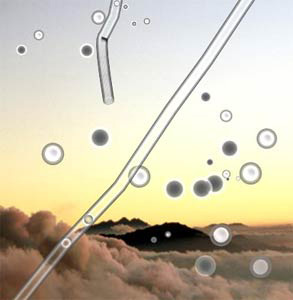 This suggests that floaters have been widely interpreted as a mythical or spiritual phenomenon; and that there might be a perceptual dimension of floaters that modern ophthalmology fails to see. This article provides a trip to the visual worlds of Pharaonic Egypt and suggests that vitreous floaters have found their way into the art and imagination of this ancient civilization. Thanks so much for your time and your critical and delightful messages. I would like to remove the quarterly appearing newsletter "Holistic Vision"